California United Terminals Inc. has announced it is closing its terminal at the Port of Los Angeles. Its last OffPeak shift will be Thursday night, June 13. CUT is currently working its last vessel. It has advised that effective Monday, July 17, it will no longer offer an OffPeak shift, but will keep labor during the day to work the gates and yard through the end of July, when it will cease those operations as well. Beginning Monday, July 17, CUT will no longer collect a Traffic Mitigation Fee on cargo moving during day shifts. For more information, please contact CUT at 310-521-5000. 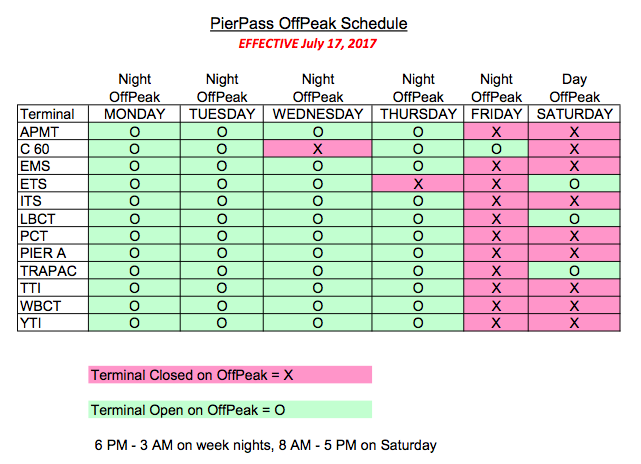 A new schedule of OffPeak gates beginning July 17 is available at https://www.pierpass.org/wp-content/uploads/2017/07/RollingSchedule-170717_2.pdf and has been posted below. LONG BEACH, Calif., June 27, 2017 – The West Coast MTO Agreement (WCMTOA) today announced that on August 1, 2017, the Traffic Mitigation Fee (TMF) at the Ports of Los Angeles and Long Beach will increase by 2.3 percent. The adjustment matches the combined 2.3 percent increase in longshore wage and assessment rates that take effect on July 1. Beginning August 1, the TMF will be $72.09 per TEU (twenty-foot equivalent unit) or $144.18 per forty-foot container. The TMF is charged only on containers that are moved between 3:00 a.m. and 6:00 p.m. on weekdays. No TMF is due for containers moved during OffPeak shifts (6:00 p.m. to 3:00 a.m. on weekdays or 8:00 a.m. to 5:00 p.m. on Saturdays). Using a congestion pricing model, PierPass charges a TMF on weekday daytime cargo moves to incentivize cargo owners to use the OffPeak shifts. The TMF also helps offset the cost of operating extended gate hours. Labor costs are the largest single component of extended gate costs. According to an analysis by maritime industry consultants SC Analytics, the net costs incurred by the terminals to operate the OffPeak shifts in 2016 totaled $224.7 million. During that year, the terminals received $182.7 million from the TMF, offsetting about 81 percent of the OffPeak program’s costs. PierPass is a not-for-profit company created by marine terminal operators at the Port of Los Angeles and Port of Long Beach to address multi-terminal issues such as congestion, air quality and security. The West Coast Marine Terminal Operator Agreement (WCMTOA) is filed with the Federal Maritime Commission, and comprises the 13 international MTOs serving the Los Angeles and Long Beach ports. For more information, please see www.pierpass.org. LONG BEACH, Calif., May 12, 2017—PierPass will retain a transportation consulting firm to evaluate the operational, business and traffic impacts of two alternative models for providing extended hours for truck gates at the marine terminals in the Ports of Los Angeles and Long Beach. The PierPass Advisory Committee (PPAC) and the Extended Gates Subcommittee met last week to review industry feedback received on two alternative models to the current OffPeak program and to identify key issues for the consultant to investigate. The May 4 meeting continued a process that began at the Extended Gates Workshop held on Oct. 20, 2016, when the 13 marine terminals that comprise the West Coast MTO Agreement (WCMTOA) met with more than 70 leaders representing importers, exporters, trucking companies, logistics providers, government representatives, port authorities and other stakeholders. Since then, the PPAC has held a series of meetings to review proposed models and make a recommendation to WCMTOA, which is responsible for deciding on any changes to the OffPeak program. The three alternatives initially proposed were variable and dynamic pricing, under which the Traffic Mitigation Fee would be higher in times of high gate activity and lower in times of low gate activity; a lower flat fee applying to both day and night moves, with appointment systems to help regulate traffic flow; and port-wide peel-off, in which trucks would operate like taxis in an airport queue. Variable and dynamic pricing was subsequently eliminated from consideration. For more information on these models, see https://goo.gl/Vxi89y. On Nov. 3, detailed notes from the Oct. 20 meeting, including pros and cons of each model, were distributed to PPAC members and additional feedback was requested. Those notes became the original basis for the recommendations report being developed by the PPAC. The PPAC met on Dec. 8 to begin developing the recommendations report. Participants reviewed industry feedback received and offered additional points of view. At this meeting, the variable and dynamic pricing model was removed from consideration as it had received no industry support. On Feb. 1, an initial version of the recommendations report drafted by PierPass staff was distributed to PPAC for review and feedback. The PPAC met on Feb. 22 to review the initial draft and collect feedback. At that meeting, participants discussed the need to bring in a third-party consultant to analyze the ideas under consideration, due to the complexity and possible side effects of these changes. On March 15, a revised draft of the report was sent to the Extended Gates Subcommittee for review and feedback. This draft included the recommendation to hire an industry consultant. Committee members submitted input by April 14. On May 4, PPAC and the Extended Gates Subcommittee met to review the recommendations, develop the scope of work to be included in a Request for Proposal (RFP) for consulting firms, and take recommendations for specific consulting firms. Evaluation of the ability of a port-wide appointment system to maintain a roughly even split between day and night traffic. Recommendations on how dual transactions (dropping off one container and picking up another during a single truck visit) could be facilitated under each alternative system. Recommendations for handling regulatory, compliance and other challenges to implementing a port-wide peel-off system. The PierPass Advisory Committee includes more than 25 leaders representing cargo owners, trucking companies, brokers, terminal operators and other stakeholders. The Extended Gates Subcommittee includes 15 additional industry stakeholders who volunteered at or after the Oct. 20 meeting. PierPass launched the OffPeak program in 2005 to reduce severe cargo-related congestion on local streets and highways around the Los Angeles and Long Beach ports. Using a congestion pricing model, PierPass charges a Traffic Mitigation Fee (TMF) on weekday daytime cargo moves to incentivize cargo owners to use the OffPeak shifts on nights and Saturdays. The TMF also helps pay for the labor and other costs of operating the OffPeak shifts. On Dec. 8, members of the PierPass Advisory Committee met to continue the process of evaluating potential alternatives to the current extended gates model used at the Ports of Los Angeles and Long Beach under the OffPeak Program. The process began on Oct. 20, when the 13 container terminals that comprise the West Coast MTO Agreement (WCMTOA) met in San Pedro with more than 70 leaders representing importers, exporters, trucking companies, logistics providers, government representatives and other stakeholders. At the Dec. 8 meeting, the PierPass Advisory Committee reviewed the feedback received at the Oct. 20 meeting, and members offered their points of view on the benefits and challenges of the three alternative models. During the Dec. 8 meeting, the first option – variable and dynamic pricing – received no support from Committee members, echoing the cool reception it received at the Oct. 20 workshop. This option has been removed from consideration. During the remainder of the Dec. 8 meeting, attendees offered detailed feedback on the “flat fee tied to an appointment” and “port-wide peel-off” options. An initial draft report will now be prepared by PierPass staff, which the Advisory Committee will review and meet to discuss in February. The subsequent revision of the report will go to the Extended Gates Subcommittee for review and feedback in March. PierPass is scheduled to distribute the final draft of the Extended Gates Report and Recommendations in mid-April, and a follow-up to the Extended Gates Workshop has been scheduled for early May. For comparison, the average in-terminal turn time in October was 50.2 minutes for the day shift and 51.2 minutes for the night shift. In October, terminals had the additional burden of redistributing Hanjin containers to other terminals, while in November, conditions returned to normal. All terminals were closed on Thursday, Nov. 24, for the Thanksgiving holiday, and some terminals were closed on Friday, Nov. 25. Terminal operators at the Ports of Los Angeles and Long Beach held an Oct. 20 workshop with industry stakeholders to evaluate potential alternatives to the current extended gates model used at the ports under the OffPeak Program. The 13 container terminals that comprise the West Coast MTO Agreement (WCMTOA) met in San Pedro with more than 70 leaders representing importers, exporters, trucking companies, logistics providers, government representatives and other stakeholders. A copy of the presentation used at the workshop is available at https://goo.gl/6FUWKD. As of Oct. 17, eight of the 13 container terminals in LA-Long Beach were using appointment systems. On that day, ETS (Everport Terminal Services) began using its system for import loads. More information about the ETS appointment system can be found at http://www.etslink.com. A ninth terminal, YTI (Yusen Terminal Inc.) plans to have an its appointment system running by March 2017. For comparison, the average in-terminal turn time in September was 45.1 minutes for the day shift and 47.1 minutes for the night shift. Turn times increased in October as terminals redistributed Hanjin containers to other terminals. All terminals were closed for the OffPeak shift on Oct. 6 for an ILWU Stop Work Meeting. Each month we provide a summary of the latest transaction data from marine terminal operators (MTOs) at the Port of Los Angeles and Port of Long Beach. Below please find data from the month of September 2016. For comparison, the average in-terminal turn time in August was 43.4 minutes for the day shift and 45.9 minutes for the night shift. A gate move occurs when a container enters or leaves a marine terminal via the truck gates. Peak shifts are Monday through Friday, 8:00 a.m. to 5:00 p.m. OffPeak shifts are all other times and are considered exempt from the Traffic Mitigation Fee. All terminals were closed for the both shifts on September 5 for the Labor Day holiday.